I’m on a roll! Another outfit with a pop of color! Pastel green with polka dots!? Hmm…I’m not sure what to think of this combo. I’m linking up with Visible Monday and Monday Mingle and . Go check out the ladies! I got this email from a friend and wanted to pass it on…I love it! I’m passing this on as I did not want to be the only old person receiving it. Actually, it’s not a bad thing to be called, as you will see. Old People remember World War II, Pearl Harbor , Guadalcanal , Normandy and Hitler. They remember the Atomic Age, the Korean War, The Cold War, the Jet Age and the Moon Landing. They remember the 50 plus Peacekeeping Missions from 1945 to 2005, not to mention Vietnam . If you bump into an Old Person on the sidewalk he will apologize. If you pass an Old Person on the street, he will nod or tip his cap to a lady. Old People trust strangers and are courtly to women. Old People get embarrassed if someone curses in front of women and children and they don’t like any filth or dirty language on TV or in movies. Old People have moral courage and personal integrity. They seldom brag unless it’s about their children or grandchildren. It’s the Old People who know our great country is protected, not by politicians, but by the young men and women in the military serving their country. We need them now more than ever. I was taught to respect my elders. It’s just getting harder to find them. Wishing you wonderful week, and thanks for visiting! Wow! Jackie O? I love her style! 🙂 Thanks! I love that your daughter commented above! Sorry for the late reply, I didn’t see your comment until today. i love your “old people” post. such true statements! i also love your color mixing in this outfit. i happen to think they go together very well! Thank you! I thought it was a great list as well. Cute outfit fun for Spring. I love your smile in the last photo! 🙂 And you’re so trendy! Pastel colours like mint greens and light pinks are so in this season! I’ve been wanting to wear some mint green pants with a polka dot top and after seeing your post, I’m going to go for it! I love the combo on you! I think that sounds fabulous. I’d love to see it! great post my dear, brought tears and made me proud to be an ‘old people’! Love the pastel green and polka dots! Fun combination–and loved the ripped jeans from the previous post…you look anything but old! Here’s to faux fur! Thanks for showing off your style on Monday Mingle! I’m trying not to look my age but to look appropriate for my age…THAT was confusing!? It absolutely works Jeannie! I’m so loving mint green right now. It seems to be the rage right now!! You were smart to come up with a look that works for both Visible Monday and EBEW! In looking at the outfit, the dots are either turning green or making the pale green jacket look almost white. What to you do to keep your legs in such great shape? I actually planned the green outfit knowing EBEW was the next day. I don’t have a lot of time for photos so this worked out great. Haha…I thought the same thing when looking at the photos. Thank you for the compliment…I work out (not lately tho) with kettlebells when I can. It’s a great overall body workout without putting too much strain on my joints like running (which I gave up after experiencing some pain in my knee). very classy and elegant look …at the same time, the polka dots add some cute touches to the outfit. I enjoy talking to elderly…they have so much experience and knowledge to impart! I agree with you about our elders. It saddens me to see so many just barely existing in nursing homes. Thank you so much!! It means a lot! 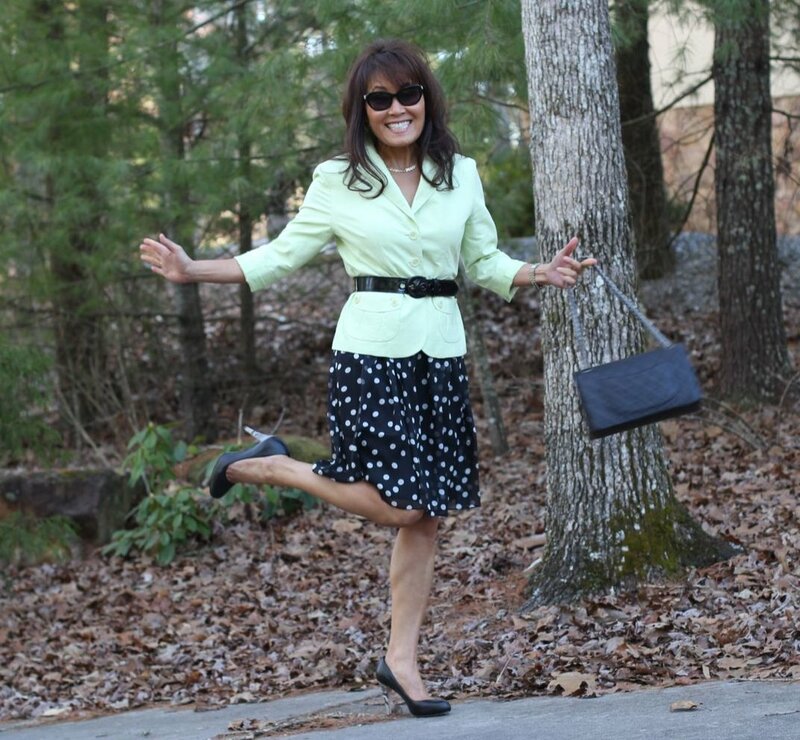 i’m a fan of the polka dots — very much a “welcome spring” outfit! Anyhoo, I hope you had a good day! wow, this is such a feminine and pretty look! Love the pastel min and the polka dots! You look beautiful! Hope you are having a wonderful day! I think you’ve knocked it out of the park! Wow! You must like polka dots? I will take that as a complement coming from you! Love the shape of your skirt and the pop of color of the green jacket looks great! Thanks so much! The skirt is quite light, feminine and flirty. It would probably look fantastic on a younger gal, with it shortened, combined with a white t-shirt and a colored belt. I just might have my daughter try that! The green looks phenomenal on you … but then, I’m yet to see you in something that does not look stunning. It’s been a long difficult day, and this has made my evening! Ooh yes, I definitely like that combo – very fresh and funky! I like fresh and funky! Thank you! Yes, got back home yesterday and have been sleeping for England ever since! Yes! You look fresh and vibrant like a spring flower. That sounds very cheesy, but it’s true! I knew you would like the list as you’ve probably experienced them first hand. I like it! Apparently mint green is the colour this spring… the one we’re all supposed to be wearing. It definitely looks good on you. and you can never go wrong with polka dots!! This was a hit or miss for me….wasn’t quite sure about it. I guess it looked okay. I really like this!! It incorporates the new hot color mint green in such a cute way!!! Very pretty Mom! Love the spring colors! You look as fresh as a spring day! Love it, and love your post about old people….so true! Thanks! That was my intent. It was so pretty this weekend…got the spring fever! I love old folks (the ones I know that is), they are a different breed…I wanna be just like them! I like this essay, I am passing it on today! You look wonderful in your polka dots and pastel — thanks for sharing with Visible Monday! Glad you like the essay…I can SO relate to it now. I really like it! Also, I now have more appreciation of myself, being older and all!!! 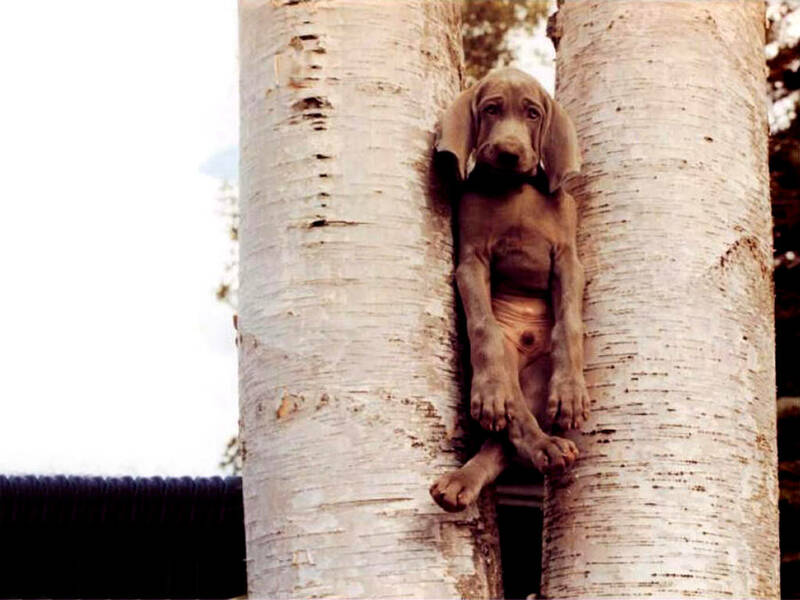 Love the cute animal post. Enjoy the day. I agree! I consider my self one of the old people…I have many friends who are elderly, and I love them to death! Have a great week!